This post is written by Pierre Richard, Principal, Jaxo, Inc. I know, by experience and practice, the importance of the first hours—or even the first minutes—spent discovering and learning new concepts. During this period, developers take their go/no-go decision, mostly based on the apparent complexity of what they see. Once you gain expertise in a given domain, you have tendencies to forget the obvious, the basics, which is where the new developers (“newbies”) need the most help. Experts are focusing on topics largely irrelevant to newbies wanting to get the essentials. A Getting Started guide should never be written by an expert—it’s too late because they forgot what it’s was like to be a newbie. This document and fxosstub were written by a Firefox OS newbie. I enjoy and respect the Mozilla community. I thought that I could give my 2 pence to the Firefox OS community, while learning about their new work. So, I decided to gain profit of my inexperience in playing the Janus figure, keeping one of my faces as the newbie as long as I could, and then switching to the veteran face when needed. This is where the Firefox OS “Hello, World” sample, fxosstub, derives. Basic EcmaScript, HTML, and CSS versus HTML5, CSS3, JS Objects, JQuery, requireJS, Node, Volo, etc. A fxos application is a big blue Install button. I was wrong, of course. What’s the role of this Install button? I was afraid to press it. Use the force and read the code! Do I need to learn requireJS? Why the strange syntax/look of these functions? Whats is B2G? Alas, R2D2B2G doesn’t work, but that was mid-November, and now it does – it has now evolved into the Firefox OS Simulator. This seemingly random directory structure is frustrating. What’s www? tool? → 3 out of 4 newbies may give up at this point. Ask Google! Search for GaiaChrono, MozillaBall. Ah, that’s better. I have to simplify all of this, and reduce a “Hello, World” to the minimum. Examples are buried in ~/.mozilla/firefox/lkz6bqgi.default/extensions/r2d2b2g@mozilla.org/profile and in there is a r2d2-installed application, zipped. Ah ha! So, that’s the way they do install, but there was a mistake in the launch-path. Should I install BootToGecko? OK, let’s do it. It smells like Android. Lucid, Precise, 32, 64? adb-get install? Use Nightly? I wasted 1 day on this and so will finish later this +6-hours long build, if it is really necessary. I had written several apps on Google App Engine (GAE) and these should be good candidates to use to build an application for Firefox OS because they’re HTML5, they’re RESTful (through XMLHttpRequest, not JQuery), and they interface with Google APIs. One of my GAE applications, Genetick, I decided to “install” on Firefox OS. How? If I forget the icons, I get a cryptic message. I have to remove the launch-path, and get rid of the cache line as well. A standard Install JS Object, private. A setInstallButton JS method, exported. 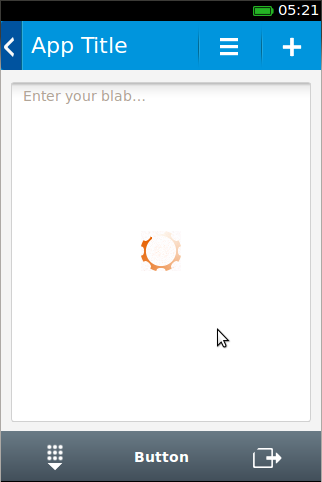 Navigate your Firefox OS Simulator (former r2d2b2g) to http://8.jaxo-genetick.appspot.com and press the install button. Do the same on a Firefox OS device. In my opinion, this makes it much more obvious to the newbie how Firefox OS deals with mobiles, and raises their enthusiasm! Note that I couldn’t show it on FxOS-Desktop, problems on Ubuntu 12.04, no dashboard. Newbies love new-look designs, that makes them feel they gain the knowledge and ownership of the application. Where are all those icons the Camp advertised about? No place to go. The icons I dug up from the samples are of different sizes (30, 32, 40), different naming schemes, etc. Sigh! The CSS3’s scripts are obscure. It seems that the styler added rules over a set of defined rules, some of them new just for nullifying previous ones—using role, type, id, classes—increasing the preferences or, worse, exploiting the order of rules as it happens to be implemented. On the HTML side, there is no clear pattern giving life to the design concept, i.e., between nav, section, and menu. What HTML5 tag should I use?! Make sure the fonts and color pan-tones obey the Firefox Identity rules. It began with the twittershare application, because it wasn’t the worst application regarding its look’ n feel (and structure, although it could have been better at terminology). It also was the one closer to a vanilla application, from a newbie point of view. A js directory containing install.js. Then, as a newbie, I was able to adapt my GAE application—mentioned earlier—in the context of a Firefox OS mobile device. This step took 3 hours, starting from the stub. Now, a newbie can start to get more involved with Firefox OS and the community, trust the approaches, feel the power. Soon, the newbie will be an expert. The most simplistic, minimalist pattern to get the most newbies started building an application for Firefox OS on mobile, and it must stay as such: no rings, no bells. The Ariadne’s string through the Labyrinth, just enough to wake up the enthusiasm of legions of developers. Those, one day or another, will evolve to the wonderful world of requireJS, Volo, and the rest, but not at the start. Target the widest audience first. fxosstub does absolutely nothing, except to show a screen suitable for obtaining the familiar layout of a mobile application aujus Firefox: a top header—with an install button, a body section, a bottom toolbar—with normalized icons. In the body section, there is a text area—launching the virtual keyboard—and a progress bar. All of this is supposed to self-adapt to an adequate size, keeping the text readable, the buttons finger-reachable. What is required on mobile with touch screens of reduced size. The idea is to enrich “fxosstub” with more elaborate revisions as my experience with Firefox OS increases. I started with something extremely simple — although for me, it wasn’t that easy to achieve. Next revision — targeted in one week or so — will focuse on putting all these buttons at work. It will probably introduce page transitions… but it’s a bit early to say. What is the main resource for learning firefox os? where can I start? To my opinion, Firefox currently suffers from its youth and success, and that means too much ressources for a newbie to seek for. I’m like you, I didn’t find the “Ariadne’s string” and was overwhelmed by too much information. Why I wrote this article. very nice, thanks for sharing Pierre. Thanks for sharing such a useful details. But, truely speaking, I didn’t get it much. I am newbie to this web development part. Can you please guide me, from where do I start if I want to learn and develop applications in Firefox OS? Is there any UI or like that for fxos development? I have installed d2r2b2g on my windows machine. For building apps for Firefox OS, I believe the Apps documentation is a good place to start. To learn web development overall, take a look at MDN. Firefox OS Simulator (former R2D2B2G) is then a great tool to test your code and apps with. Thanks Robert. One out of the track question, how can I add my Profile/Avatar like you and others have? I’m also a newbie. But i make firefox extensions. I want to make an app that runs in background, that monitors phone call. When it comes in it should read the number outlod. For that you would need the WebTelephony API, but I can’t guarantee the best approach to a background process for that. Try asking in IRC in the #gaia channel. Thanks Robert. off the track question, how can I add my Profile or Avatar? You need to connect your e-mail address – the one you used when commenting here – to a Gravatar.